Halifax Lane climb starts in the village of Luddenden and winds its way up to the top of the moors. It is consistently steep, climbing 189m in just 1 mile, averaging 12%. 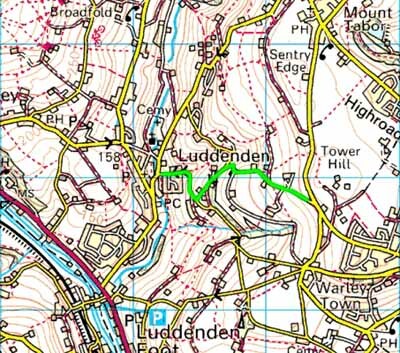 It starts in Luddenden and goes up Halifax lane for 300 metres. The climb is steep from the start, averaging 16% for the first 300metres. Then you turn left into Birch Lane.The gradient reduces slightly to 10%, but you have to tackle two hairpins, where the gradient increases to a max of 19%. If you ride wide around the Apex, you can limit the severity of the gradient. It is only towards the last 300 metres that the gradient eases off to a manageable 7% as you head towards a junction and the end of the climb. If you want to avoid the steepest section on Birch lane, you can go straight on up Halifax Lane and take a longer route to the top, but if you’re looking for steep hairpins, then the shortest way up Birch lane is the most challenging. 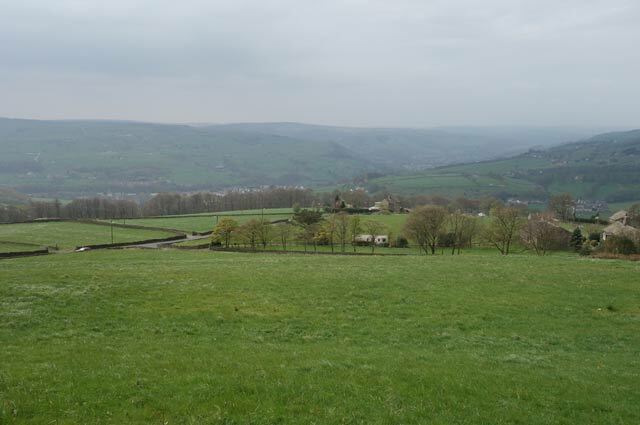 Halifax Lane / Luddenden bank was used in the 2003 National Hill Climb, where Jim Henderson won in a time of 5.19. (Jim Henderson’s page) He was riding a 42*21 fixed. When I rode during a long training ride (on a TT bike) I was climbing in a 39*25 and 39*28 on the steepest section. It took me about 7.24 mins for the full climb. It is not a climb to be treated lightly. 190 metres in one mile is a rapid height gain. But, it is never too ridiculously steep. If you have the right gears and avoid the steepest apex, it is manageable. It is a little hidden away in the village of Luddenden. It is quite close to the much more popular Cragg Vale, hill climb so there’s another type of climb, you could always include in the same ride. Course: START in Luddenden village on unclassified road Halifax Lane opposite lamp-post No. 1. Proceed to junction of Birch Lane, turn left and proceed up Birch Lane, which runs into Raw End Road, to FINISH at telegraph pole No. 2.